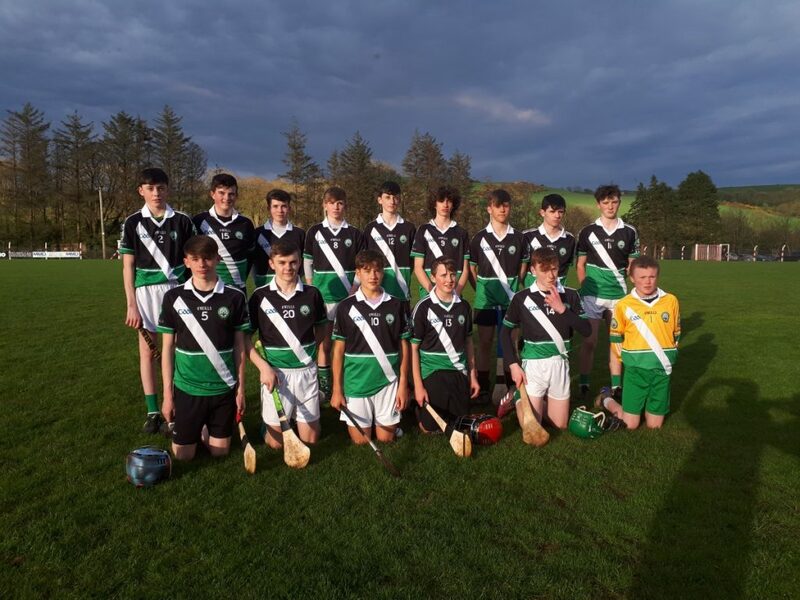 The U16 hurlers eventually got to play their first hurling game of the season in Ballinspittle on Monday night. Courcey Rovers won by 8 points but the new Shamrocks/Crosshaven hurling combination can be happy with their efforts in their first ever outing. They had 15 players on duty and all got plenty of game time and contributed well. Seán Andrews got an early DÓM goal and they led 1-0 to 0-2 early on. The lads played well together for a time but for the last 10 minutes before HT, Courcey Rovers went on a scoring spree and scored 2-4 without reply to move 3-6 to 1-3 ahead at HT. Tim Sheehan had another DÓM score in that half. The second half was much better and after Courcuies scored 2 early points, the DÓM lads got the bit between their teeth. From 10 points down, they took over and scored a couple of goals from Mark Sisk and Adam Power. They were now within a goal of Courcies but that al important equalising score never came despite plenty of chances and Courcey Rovers finished the stronger. Overall, a good first outing. Shamrocks U10 footballers beat a Douglas selection on a heavy bottom pitch in Shanbally on Saturday morning. The home team started very strong and kept the pressure on the visitors to the end resulting in a big winning margin of 5-6 to 0-1. Well done to all and to manager Andrew O’Neill and referee Adrian Doolan. The u8 footballers played Sliabh Rua, Tracton and Ballygarvan in Minane Bridge. They had 10 players togged and entered the 1 team. The players did much better this time after a frustrating day the week before. Shamrocks had 10 players, played 3; lost 3. No other report available. Shamrocks lost a tight game in the Tank Field on Friday night in a game that could have gone either way. Well done to all on a decent performance. Shamrocks U10 hurlers played Crosshaven on Thursday night in Camden. The home side came out on top in what really was a game of two halves. Shamrocks were on top in the first half while Crosshaven were on top in the second. Shamrocks players on duty: Luke Jordan, Liam Dorney, Harry O’Leary, Jack O’Sullivan Kearney, James Keane, Donal Herlihy, Calum O’Neill, Seamus O’Mahony, Ollie O’Brien, Shane O’Flynn, Billy Hanna, Calum Fitzgerald, Ronan Crotty, Ryan Doolan, Seán Óg Lynch. Aghinagh made the long journey to Shanbally this evening for this 2nd league fixture of the season. This game was well contested for up to the third quarter. Shamrocks held a good lead at that stage and looked likely winners. However, they ground to a halt and allowed their opponents to dominate the last quarter to run out easy winners. This was a game Shamrocks left behind; a real pity as they were in control and playing so well. They’ll dust ourselves down and go again and hope to have learned from this experience. Thank you to the supporters. Panel – Josh Bartlett, Fionn Herlihy, Barry O’Mahony, Sam Foy, Declan Carroll, Kieran May, John Coleman, Aidan Brady, Robert Barrett, Derry Howard, Aaron Clarke, Conor Coleman, Michael Foy, Cian Lynch, Cathal O’Donovan. Shamrocks u10s took on a talented Nemo Rangers team on Saturday morning in their second football match of the season. A full squad lined out for what turned out to be a great game. A great first half by the Shamrocks backs meant Shamrocks held a slender lead at halftime. Nemo came out strong in the second half and surged into a 4 point lead but a determined and spirited effort by the Shamrocks lads saw them score 4 goals and take a great win. Well done to all. Team on duty: Liam Dorney, Luke Jordan, Billy Hanna, Harry O’Leary, Seán Óg Lynch, Callum O’Neill, Jason O’Driscoll, Ryan Doolin, Calum Fitzgerald, James Keane, Shane O’Flynn, Seamus O’Mahony, Ollie O’Brien, Donal Herlihy, Ronan Crotty.